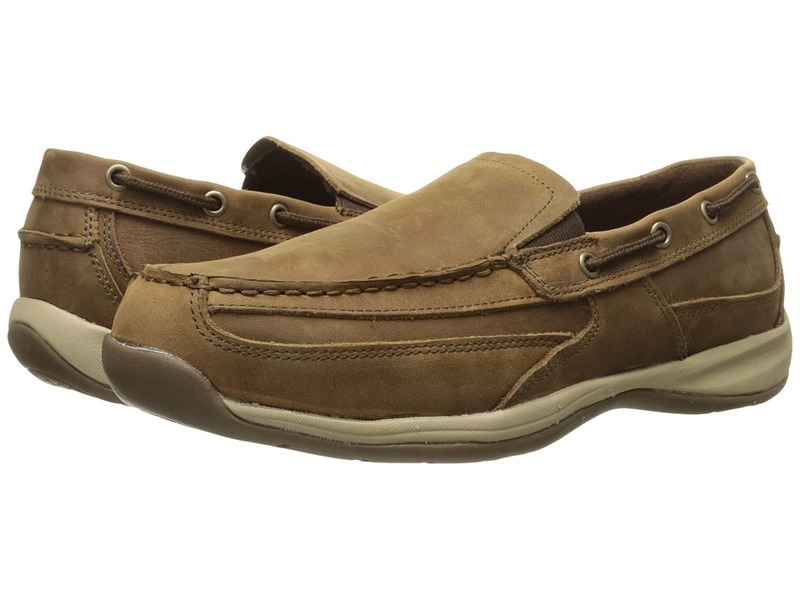 For a solid work ethic that won~t let you down, choose the Rockport Works Sailing Club boat shoe. Style number: RK6737. Meets I/C75 electrical hazard, CSA impact, and CSA electrical shock standards. Safety rating includes: Best: slip-, oil-, abrasion-, and chemical-resistant performance. Good: heat- and metal-chip-resistant performance. Steel toe. Slip-on design. Crazy Horse leather uppers. Moc toe construction. Brushed microfiber lining offers a great in-shoe feel. Removable EVA Cushion Insert insole with Heel Stabilizer Cup. EVA midsole cushioning provides daylong comfort. Slip-resistant rubber outsole. Imported. Measurements: Weight: 1 lb Product measurements were taken using size 9, width M (D). Please note that measurements may vary by size. Weight of footwear is based on a single item, not a pair. 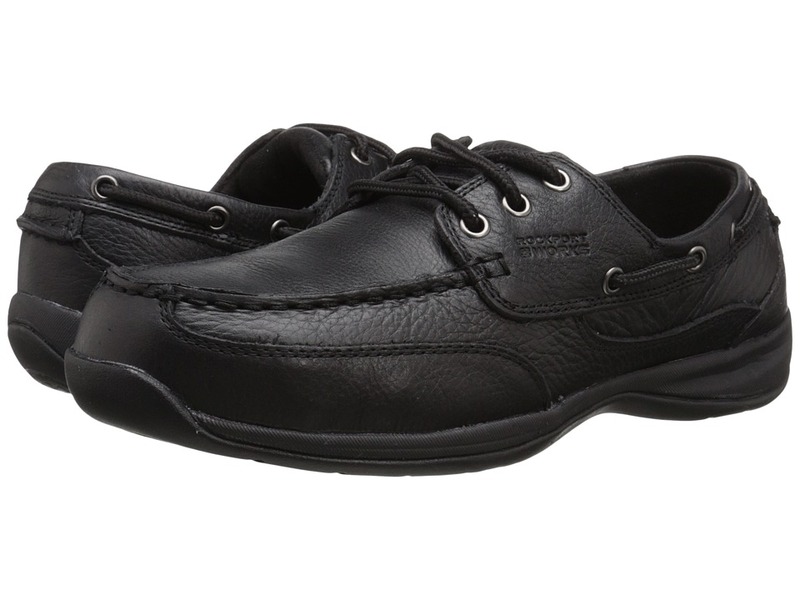 For a solid work ethic that won~t let you down, choose the Rockport Works Sailing Club boat shoe. Style number: RK6738. Steel safety toe meets I/C75 electrical hazard, CSA impact, and CSA electrical shock standards. Safety rating includes: Best: slip-, oil-, abrasion-, and chemical-resistant performance. Good: heat- and metal-chip-resistant performance. Features Electro-Static Dissipative and Dual Resistor protective technology. Leather upper. Three-eye lace-up boat shoe. Brushed microfiber lining offers a great in-shoe feel. Removable EVA Cushion Insert insole with Heel Stabilizer Cup. EVA midsole cushioning provides daylong comfort. Durable rubber outsole is slip and oil resistant. Imported. Measurements: Weight: 1 lb 1 oz Product measurements were taken using size 11, width M (D). Please note that measurements may vary by size. Weight of footwear is based on a single item, not a pair. 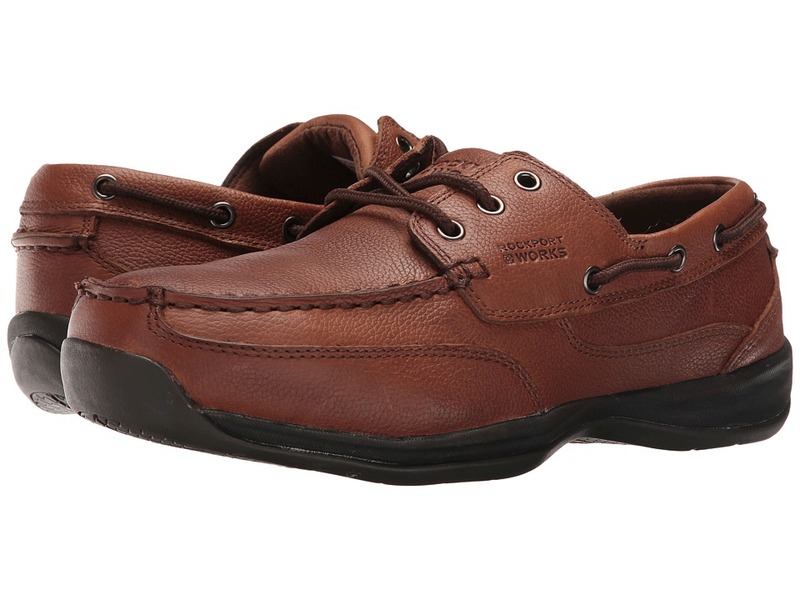 For a solid work ethic that won~t let you down, choose the Rockport Works Sailing Club boat shoe. Style number: RK6745. Steel safety toe meets I/C75 electrical hazard, CSA impact, and CSA electrical shock standards. Safety rating includes: Best: slip-, oil-, abrasion-, and chemical-resistant performance. Good: heat- and metal-chip-resistant performance. Features Electro-Static Dissipative and Dual Resistor protective technology. Leather upper. Three-eye lace-up boat shoe. Brushed microfiber lining offers a great in-shoe feel. Removable EVA Cushion Insert insole with Heel Stabilizer Cup. EVA midsole cushioning provides daylong comfort. Durable rubber outsole is slip and oil resistant. Imported. Measurements: Weight: 1 lb 3 oz Product measurements were taken using size 11, width M (D). Please note that measurements may vary by size. Weight of footwear is based on a single item, not a pair. 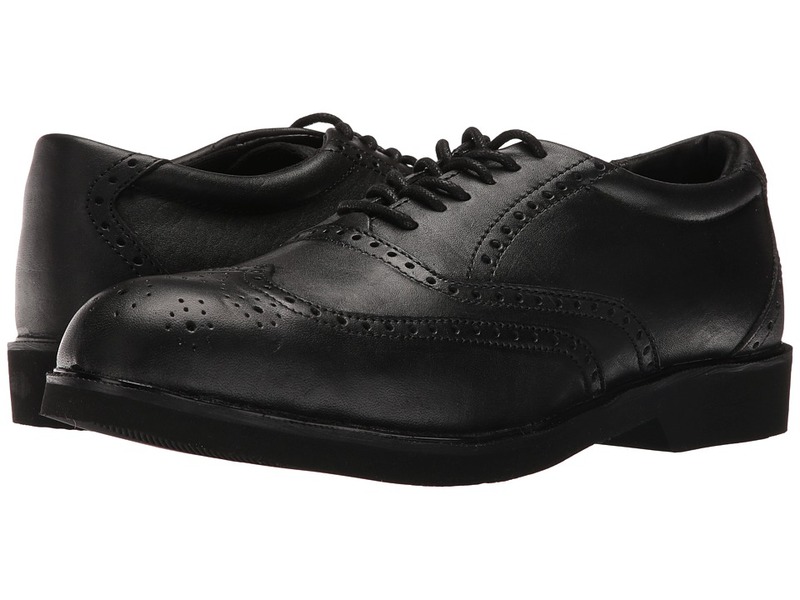 The Dressports wingtip from Rockport Works will keep you protected and comfortable during your long work day. Style number: RK6741. Safety rating includes: Better: oil and abrasion-resistant performance. Good: slip, heat, metal chip, and chemical-resistant performance. Steel safety toe meets I/C75 electrical hazard standards. Five-eye lace-up dress oxford with a soft toe design. Leather upper. Plush collar for added comfort. Moisture-wicking nylon mesh offers a great in-shoe feel. Anti-slip pigskin heel counter for a secure fit. Removable EVA cushion insert with ADIPRENE by adidas rebounding heel pad. Cushioned EVA midsole provides added shock absorption and support. 90&amp#186 breasted heel. Durable rubber outsole is oil and slip resistant. Imported. Measurements: Weight: 1 lb 3 oz Product measurements were taken using size 11, width M (D). Please note that measurements may vary by size. Weight of footwear is based on a single item, not a pair. 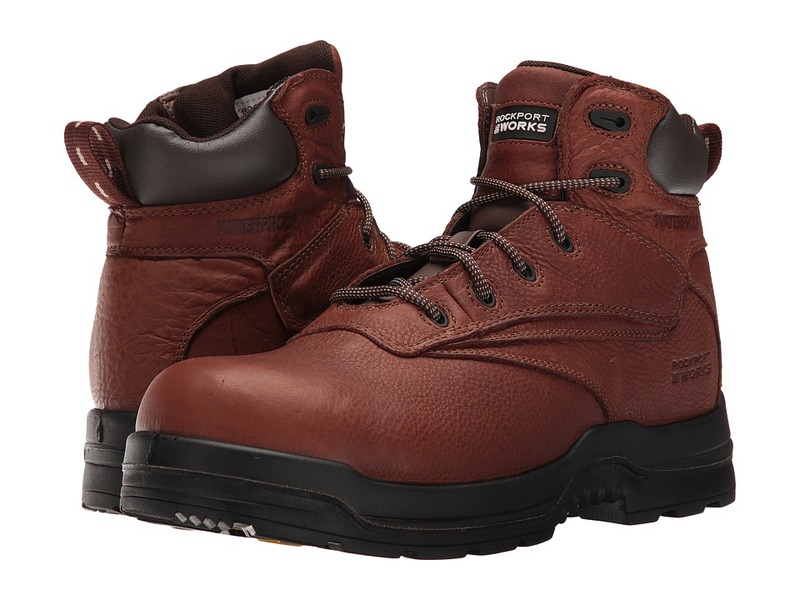 For hard-working performance that won~t ever let you down, lace into the Rockport Works More Energy work boot. Style number: RK6628. Composite safety toe meets I/C75 electrical hazard standards. Safety rating includes: Best: oil-, abrasion-, chemical-, and metal-chip-resistant performance. Better: slip- and heat-resistant performance. XTR Brand Extra Wide composite toe cap. 100 percent non-metallic toe, security-friendly boot. Waterproof tumbled full grain leather upper. Lace-up closure. Plush tongue and collar. Hydro Defense waterproof bootie construction. Moisture-wicking nylon mesh lining offers a great in-shoe feel. Removable EVA Cushion Insert footbed with ADIPRENE by adidas shock-absorbing heel and rebound forefoot pads. Dual-density, direct-attached PU midsole with ADIPRENE by adidas shock-absorbing heel. Rubber traction outsole. Imported. Measurements: Weight: 2 lbs Shaft: 6 in Product measurements were taken using size 11, width M (D). Please note that measurements may vary by size. Weight of footwear is based on a single item, not a pair. 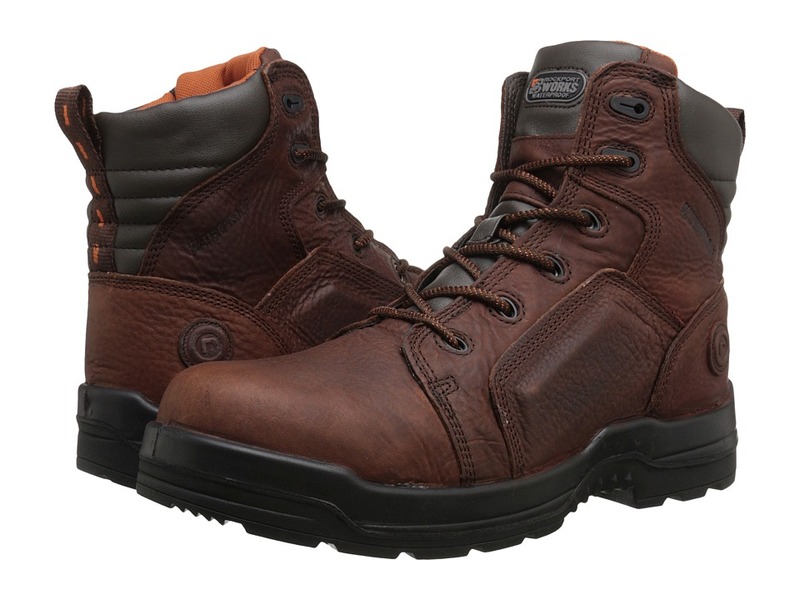 For hard-working performance that won~t ever let you down, lace into the Rockport Works More Energy work boot. Style number: RK6635. Composite safety toe meets I/C75 electrical hazard standards. Safety rating includes: Best: oil-, abrasion-, chemical-, and metal-chip-resistant performance. Better: slip- and heat-resistant performance. XTR Brand Extra Wide composite toe cap. 100 percent non-metallic toe, security-friendly boot. Waterproof tumbled full grain leather upper. Lace-up closure. Plush tongue and collar. Hydro Defense waterproof bootie construction. Moisture-wicking nylon mesh lining offers a great in-shoe feel. Removable EVA Cushion Insert footbed with ADIPRENE by adidas shock-absorbing heel and rebound forefoot pads. Dual-density, direct-attached PU midsole with ADIPRENE by adidas shock-absorbing heel. Rubber traction outsole. Imported. Measurements: Weight: 1 lb 14 oz Shaft: 6 in Product measurements were taken using size 12, width M (D). Please note that measurements may vary by size. Weight of footwear is based on a single item, not a pair. 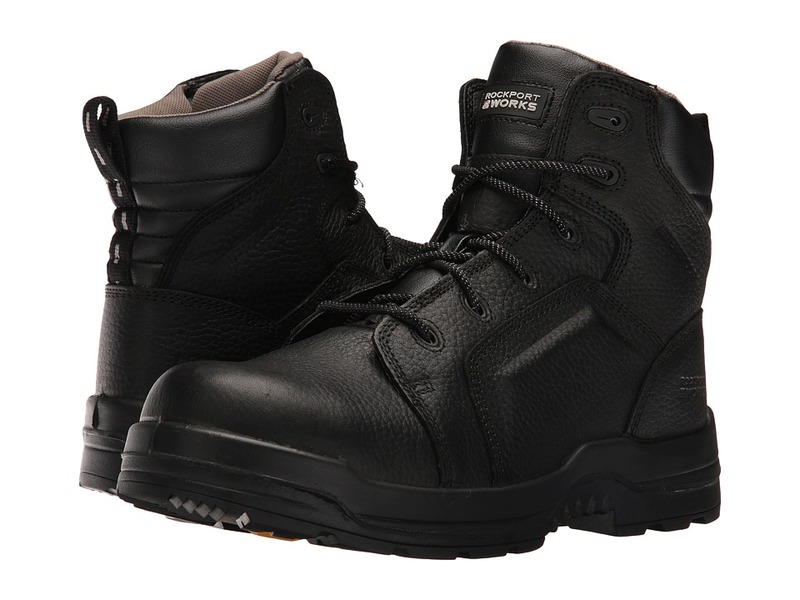 For hard-working performance that won~t ever let you down, lace into the Rockport Works More Energy work boot. Style number: RK6640. Meets I/C75 electrical hazard standards. Safety rating includes: Best: oil-, abrasion-, chemical-, and metal-chip-resistant performance. Better: slip- and heat-resistant performance. XTR Brand Extra Wide composite toe cap. 100 percent non-metallic toe. Waterproof tumbled full grain leather uppers. Lace-up closure. Plush tongue and collar. Hydro Defense waterproof bootie construction. Moisture-wicking nylon mesh lining offers a great in-shoe feel. Removable EVA Cushion Insert footbed. Dual-density, direct-attached PU midsole with ADIPRENE by adidas shock-absorbing heel and rebound forefoot pads. Rubber traction outsole. Imported. Measurements: Weight: 1 lb 9 oz Shaft: 6 in Product measurements were taken using size 12, width M (D). Please note that measurements may vary by size. Weight of footwear is based on a single item, not a pair. 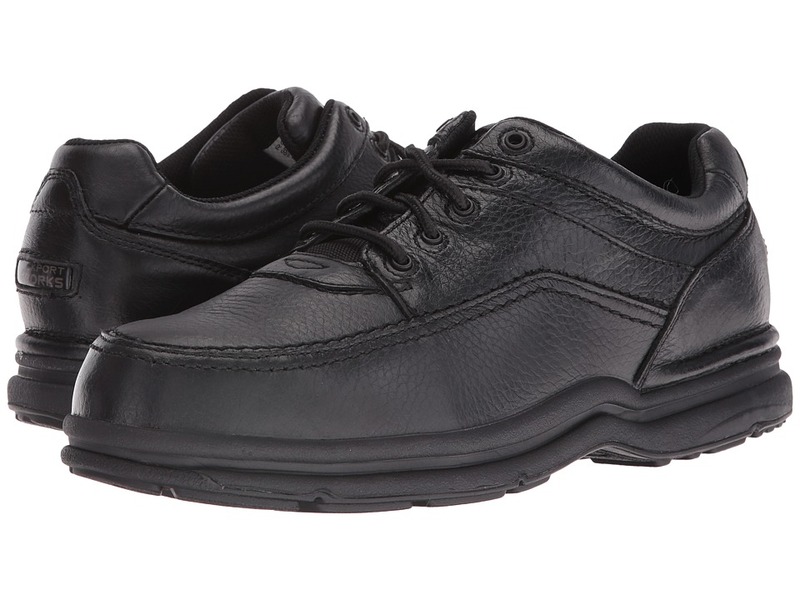 The Work Up dress oxford from Rockport Works keeps you steady and comfortable on your feet all work day long. Style number: RK6522. Five-eye lace-up dress oxford with a soft toe design. Leather upper. Security-friendly footwear. Plush tongue and collar. Moisture-wicking nylon mesh offers a great in-shoe feel. Anti-slip pigskin heel counter for a secure fit. Removable EVA cushion insert with ADIPRENE by adidas shock-absorbing heel and rebound heel pad. Cushioned EVA midsole provides added shock absorption and support. Durable rubber outsole is slip resistant. Imported. Measurements: Weight: 1 lb 4 oz Product measurements were taken using size 12, width M (D). Please note that measurements may vary by size. Weight of footwear is based on a single item, not a pair. No matter where you go, the Rockport Works World Tour oxford will keep you protected and comfortable all work day long. Style number: RK6761. 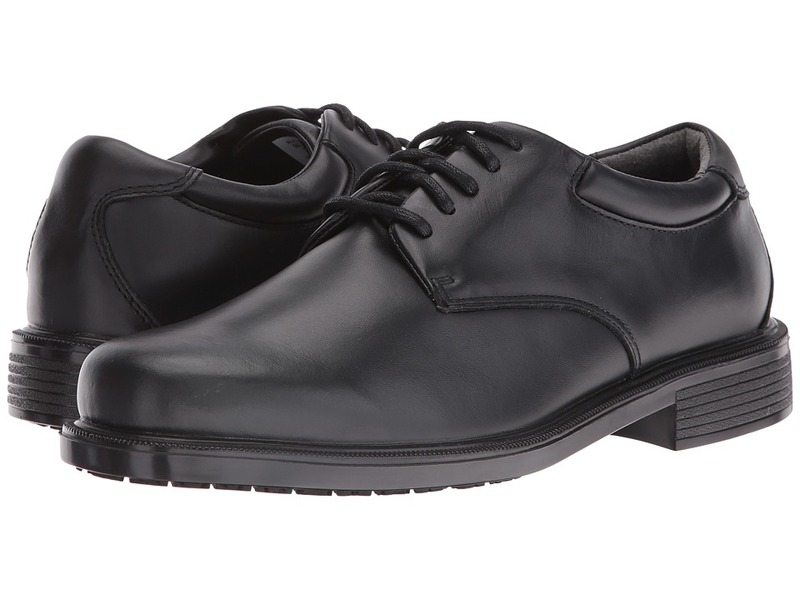 Five-eye casual moc toe oxford with a steel toe design. Leather upper. Plush tongue and collar. San Crispino construction. Lace-up closure. Moisture-wicking nylon mesh lining offers a great in-shoe feel. Removable EVA cushion insert with ADIPRENE by adidas shock-absorbing heel and rebound forefoot pads. Cushioned EVA midsole provides added shock absorption and support. Durable rubber outsole is slip and oil resistant. Imported. Steel safety toe features Electro-Static Dissipative and Dual Resistor technology and meets I/C75, CSA Impact, CSA Electro-Static Dissipative standards. Measurements: Weight: 1 lb 7 oz Product measurements were taken using size 12, width M (D). Please note that measurements may vary by size. Weight of footwear is based on a single item, not a pair.